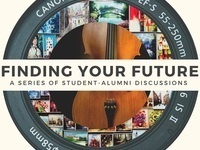 Finding Your Future events are student-alumni discussions, intended to connect students with influential alumni in fields of their career interests. These events will feature a brief keynote address, followed by an opportunity to talk with alumni face-to-face. Interested in attending? Space is limited to the first 25 students to RSVP; register on Handshake today if you would like to attend!